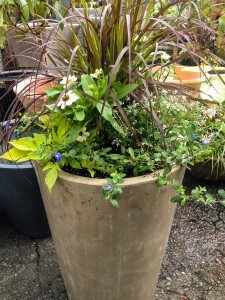 More Container Gardens…Foliage, Flowers and Pizazz! The last post highlighted a few shade planters, and I hope this one will give you ideas for your hot, sunny spots. Even with large planters maintaining a set watering schedule is important when plantings are sited in full sun. If your plantings wilt as a result of being too dry between watering over and over, eventually they’ll become so stressed they won’t recover. So, if you’ll be leaving for any extended period, ask a neighbor or friend to check your plantings and water regularly. The first planting is a classic “Thriller, Filler, Spiller” combination, designed for a tall urn, using a silver foliage plant called cardoon. 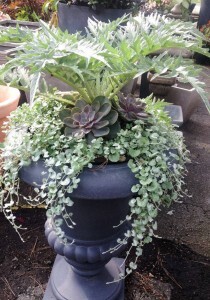 It will get very large, creating a dramatic centerpiece while the mounding, succulent echevarias fill the middle with their pinky gray rosettes. The beautiful heat tolerant trailing dichondra creates a waterfall of shimmery silver over the edge. This is the most drought tolerant of the plantings shown here but still needs attention – even succulents need water! The next uses a red fountain grass for height in a tall planter with the addition of white Profusion zinnias and white euphorbia as fillers. Spilling out are blue daze and potato vine. This planting will bloom continuously with regular water and periodic deadheading or clipping back of the zinnias. Late in the summer the grass will begin to bloom for an end of the season finale. 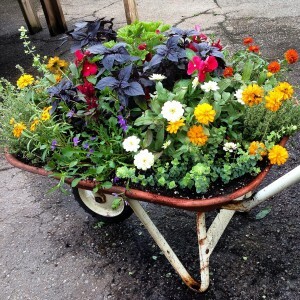 This wheelbarrow is a fun and bright mix of flowers and herbs and will provide a riot of color through the hottest months. This type of whimsical container calls for a jumble of color, and here it’s provided by zinnias, vinca, fanflower, rudbeckia, ornamental oregano, purple basil, and thyme. It would be perfect in the middle of a cottage kitchen garden! It will be necessary to deadhead the zinnias as they fade, cut back the fan flower periodically, pinch the vinca if necessary, and harvest the basil and thyme. Watering daily will be a must, since it’s planted very intensively with many plants. Many of you have pots that have shrubs in them that live year round, and just need some color added each season. 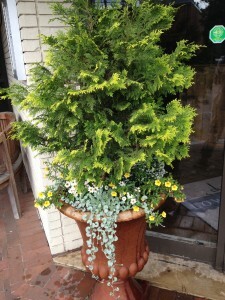 In this example, the Chamaecyparis adds yellow foliage and is complimented through the summer with yellow million bells, white narrow leaf zinnias, silver dichondra and some euphorbia. The million bells and zinnias will be cut back when they get too leggy (There’s no need to deadhead each individual bloom on these.) and it will be watered daily, since the Chamaecyparis has been in this planter for a few years and it’s roots are filling the planter quite extensively. 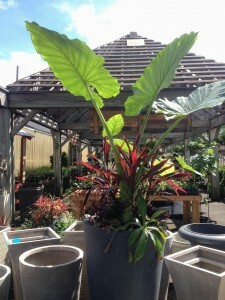 The final planting uses a dramatic, and very large Alocasia – this speaks for itself, though it has supporting players as well, including dracaena, epescia, nepenthes, and alternanthera. It’s quite a combo. I hope this and the previous posts will give you the confidence to try new plants and combinations, to be braver about cutting plants back (Yes, they do need it every now and then!) and the understanding that these types of intensive plantings need regular water whether you’re home or not to keep them looking their best. This entry was posted in Annuals, Arrangements, Bedding Plants, Container, Container Gardening, Flowers, Herbs, House Plants, Planting Tips, Succulents, Summer, Tree/Shrubs, Watering and tagged alocasias in planters, caladiums in planters, cardoon, carex 'Evergold', coleus in pots, container combos, container gardening, container gardening maintenance, containers with mixed flowers, containers with tropicals, flowers in a wheelbarrow, planter combinations for sun, succulents in containers on June 17, 2014 by Kris Blevons.